“In the name of Our Lord and Savior Jesus Christ, Charles, by the will of Divine Providence, King. “With the help of the God of hosts we achieved victory in our wars, and from Him alone we received our glory, and it is from Him that we expect happiness and prosperity in this world and an eternal reward in the next. “Hail to all the faithful of Christ! Hail to all the Saxons saved from the obstinacy of their past perfidy, those who were rebellious against our ancestors and who were for a long time rebellious against us and God, until we conquered them not by our strength, but by the strength of the Cross of the Lord. “It is from His mercy that we received the grace of Baptism, which we brought to them, offering them their old liberty and releasing them from all tributes owed to us. For the love of the One who gave us the victory, we declared them our subjects. This selection does not provide us with data on the life of St. Willehad and obliges us to comment on a decree of Charlemagne, which is quite unusual for a meditation on a life of a saint. I hope that my observations on this decree favoring the see of St. Willehad somehow express the spirit of the saint. I also hope the next selections will be less parsimonious in data on other saints. 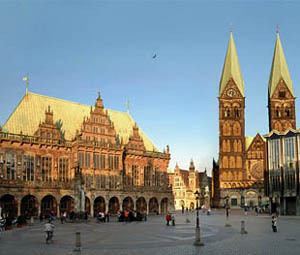 St Willehad, above, built the Cathedral of Bremen. Below right, how it looks today. Regarding this decree, it is interesting to note the intimate relation between the ecclesiastical and civil powers in that time, and the care that the civil power took of the ecclesiastical power. 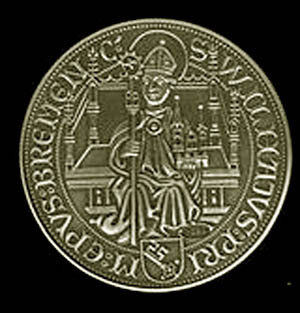 Charlemagne provided abundantly for the Cathedral of Bremen and for its clergy to promote the glory of God and the Christianization of those semi-pagan peoples. It is also interesting to observe that the Emperor listed his reasons before announcing the tax. He described how that Saxon people were pagan and had been conquered by his arms, referring by this to his right of conquest. 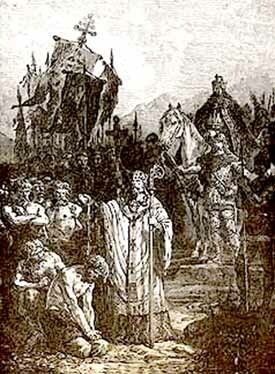 It was a legitimate right of conquest, since the Saxons were very aggressive, always invading the lands of the Franks, refusing to recognize Charlemagne as legitimate King, often looting and vandalizing Frankish villages near the borders, and above all, trying to make those cities return to Paganism. So, in a war that had characteristics of a crusade, Charlemagne invaded their lands in defense of the Catholic Religion and defeated them. Afterward, he went beyond the limits of Natural Law when he gave the conquered Saxons this alternative: Either believe or die. Understandably, the number of baptisms after his victory was enormous. On that occasion both baptismal water and blood ran in torrents. Later the Pope censured him for this action because no one can give a person such an alternative – believe or die. Let me state that I am in accordance with the Pope and not with Charlemagne; therefore, do not take my next comment as siding with the Emperor in this matter, because I do not. But many of those forced baptisms actually ended well, and the families of those men remained in the Catholic Faith, persevering in it for centuries. That is, forcing those men to be baptized was an abuse and was not good, but it produced some good fruit. In his decree, Charlemagne went on to show how the Saxons revolted many times, and how he had to fight and conquer them. In other words, he could have completely broken the Saxons, since they were a people who were always causing trouble for the Franks, but he did not. He could have completely destroyed that people, reducing them to the condition of slaves, which was feasible according to the laws of war at that time. But he did not. Instead, he exercised mercy with them. He let them resume their normal lives, only demanding that they pay a tribute to the Church. When I say that he could have completely destroyed that people, I am not saying he could have slaughtered them all. I am only saying that he could have ordered the deaths of many more of the prisoners of war, something quite common at the time. But he spared those men, ordering them instead to pay a tribute for the newly built Cathedral of St. Willehad in the city of Bremen in Saxon land. At the same time, he constructed Frankish fortresses in those lands and intensified the Christianization of that people. 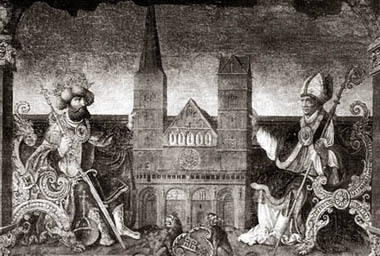 You can see that Charlemagne knew how to balance justice with mercy. His main concern was to honor divine worship. By establishing the true Religion and supporting it, by offering it the high prestige of his position, and by using the material resources of the Empire to increase and expand the Faith, he created conditions for the Church to take root in the Saxon people. This was very good for them. They could leave their barbarian ways and progress freely on the path of Catholic culture and civilization: medieval Germany in great part came from this people converted by Charlemagne. The general approach of Charlemagne, which is the backdrop for this decree, was very wise and good. It is also very beautiful to see that the Emperor attributes all his victories to God. He says: We won by the grace and help of God. It is a way to acknowledge that he was an instrument of God. Without God he would have lost the war. This means that he understood perfectly that all his power came from on high: “Charles, by the will of Divine Providence, King.” It is a very beautiful title that seems to be accompanied by the songs of angels and sound of church bells, in a setting with the splendors of nature and extraordinary lights in the sky. He was King because Divine Providence desired it so; God wanted him to be His representative in the temporal sphere and to serve the Holy Catholic Church in all those things in which the Church depends upon the civil order. This is the substance of the title. It shines with a plenitude of sacrality, because sacrality is this, to recognize Divine Providence as the foundation of everything. Do these comments have anything to do with St. Willehad’s life? I hope so, because St. Willehad is for these provisions made by Charlemagne what the flower is for the vase. If you take a magnificent vase, it only achieves its complete purpose when it holds a flower. A vase without a flower is like an orphan. It reaches its final end when a flower or a whole bouquet of flowers is placed in it. With this, the work of art of man – the vase – receives the work of art of God in nature – the flower. St. Willehad was the flower in that vase. The Emperor, the cathedral, the diocese, would never have attained their plenitude without the Saint. 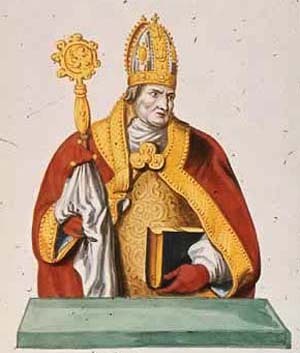 When St. Willehad agreed to be the first Bishop of Bremen, everything fell into place, and the perfume of his sanctity spread among that Saxon people. All material things are beautiful, noble, and follow the design of Divine Providence to the measure that they serve the influence of sanctity. So, we can imagine Bremen with its new cathedral, rows of converted Saxons willing to pay their tithe to properly maintain the sacred building and the divine worship. We can imagine the choir singing in the cathedral. Reigning over all these beauties in his episcopal chair is St. Willehad, a Bishop Saint, a representative of God even greater than the Emperor, because he represented God as a Bishop and a Saint. This picture helps us to imagine the role of St. Willehad in that early phase of Christendom, in that ambience prepared by the zeal of Charlemagne. St. Willehad was the flower, from him came the perfume, from him came the charm of the supernatural life, the grace that helped to maintain and increase the Catholic spirit of that people. Let us ask St. Willehad to help us rebuild and maintain a new Christendom in these times, which are much worse than his.